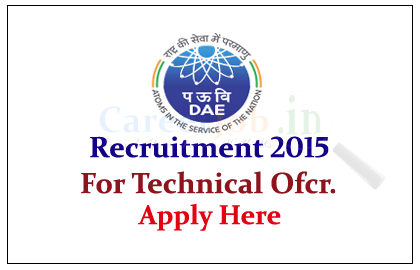 Department of Atomic Energy is recruiting 2015 for the post of Technical Officers for the year of 2015. Eligible candidate can apply on or before10th July 2015. 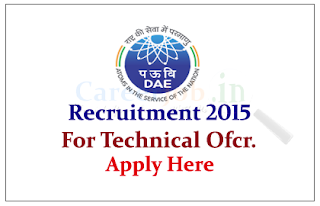 The Department of Atomic Energy (DAE) is a department directly under the Prime Minister of India with headquarters in Mumbai, Maharashtra, India. DAE has been engaged in the development of nuclear power technology, applications of radiation technologies in the fields of agriculture, medicine, industry and basic research. Interested and eligible candidate can send their downloaded application (www.gso.igcar.gov.in , www.igcar.gov.in )on or before 10.07.2015, for more details kindly check Employment News Paper, Dated: 06-06-2015 to 12-06-2015 Page no 16.